This idea came to me when I was walking to meet a friend, my (ridiculously) long hair blowing in the breeze. 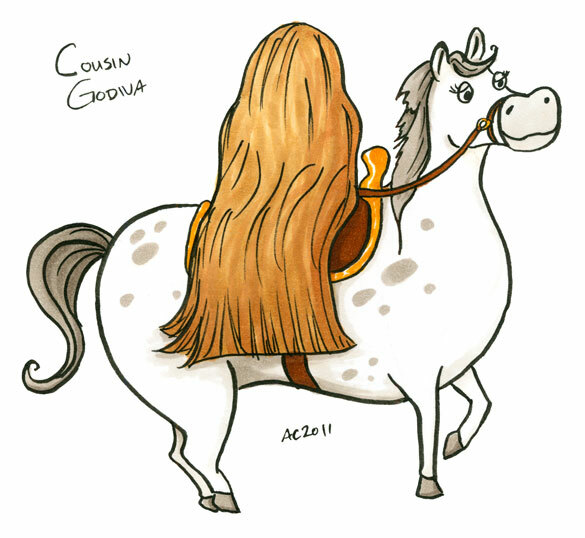 I’ve always been a bit fascinated by the idea of Lady Godiva, and of course Cousin It is a theme anyone with long brown hair will find in their life. The combination of Addams Family and legendary lady was irresistible to my cartooning fingers. With all the cartoons I do, I’m getting to be an old hand at drawing and coloring hair, so Cousin It was pretty easy overall. It’s the first time I’ve tried to weeble-ify a horse, though! Just the sort of quirky fun I needed to start my day.